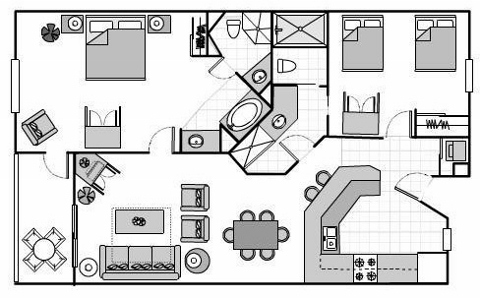 Relax inside your spacious one, two or three-bedroom vacation villa, take a soothing soak in the whirlpool, or enjoy a leisurely meal on your private patio or balcony (in some units). Experience all of the amenities of a first-class resort. In addition to the features & amenities listed below, the resort also features sand volleyball and shuffleboard courts, tennis and basketball courts, a poolside bar & grill, 24-hour front-desk and security, a children's pool with interactive fountains. There's even a 250-foot lazy river and 9-hole putt-putt golf course. It's all here for your pleasure. 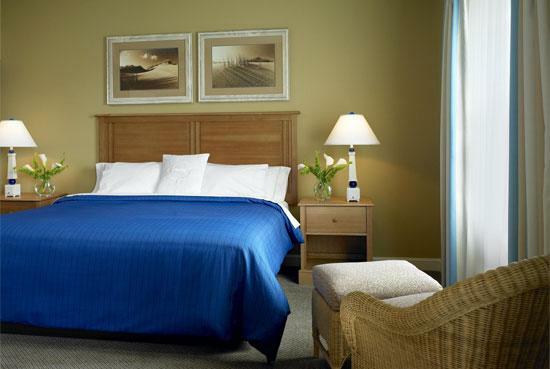 Sheraton Broadway Plantation offers flexibility. Vacation in a luxurious one- or two-bedroom vacation villa with gourmet kitchens and spacious living areas. Either way, there's plenty of room in your vacation home away from home. One-bedroom villas are approximately 472 square feet. 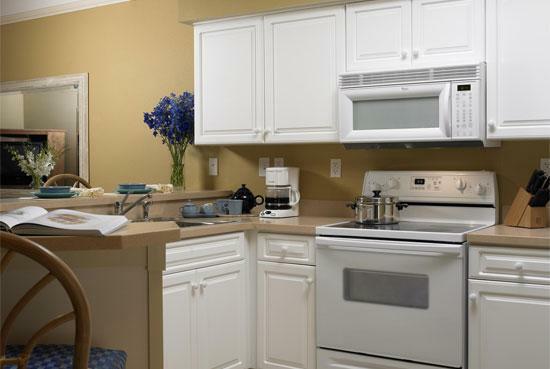 One-bedroom villas have a fully equipped kitchen or kitchenette with a microwave, blender, coffee maker, toaster, disposal, refrigerator, dishwasher, 4-burner stove, and breakfast bar. The Master bedroom features a king or queen size bed and cable TV. The living area amenities include a full size sleeper sofa, dining room (seats 4), cable TV, VCR, washer and dryer, ceiling fan, in-room safe, and complimentary wireless Internet. Two-bedroom villas are a larger 1030 square feet, and share many of the same features as the one-bedroom villas. In addition, the Master bedroom features a whirlpool tub; the guest room features two double beds, a bathroom with shower/tub combo, and a TV. The living room in the two-bedroom villas has a queen size sleeper sofa, dining room that seats 6, and a stereo entertainment center with CD player. 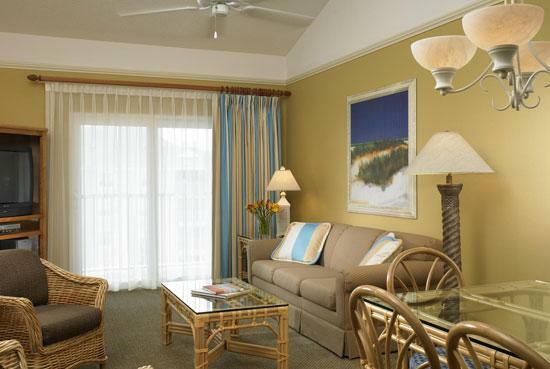 All villas feature complimentary wireless Internet access.